You can shorten a vertical antenna by using a loading coil. This online calculator tells you how the amout of inductance your loading coil will need to have. An effective system of ground radials is even more important with a shortened antenna. The already low input impedance of a quarter-wave vertical will become even less as you shorten the antenna. 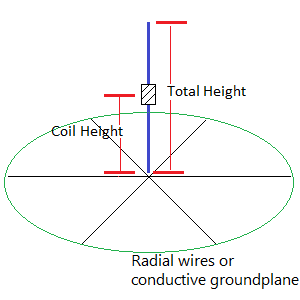 Raising the antenna above ground over a counterpoise of elevated ground wires can increase efficiency and input impedance. The size of the required coil increases with height. Placing the coil about halfway up is a good compromise. You can further reduce the height of the antenna by placing a capacitance "hat" at the top. If you would rather calculate the length of a full-size vertical antenna, see The Quarter-Wave Vertical Antenna Calculator.